Are you guilty of snacking heavily at night? You know…are you someone who after dinner continues to eat…sometimes taking in nearly half of your calories after dinner? Understand that it may not be all your fault…after all, we as humans are sort of programmed that way. 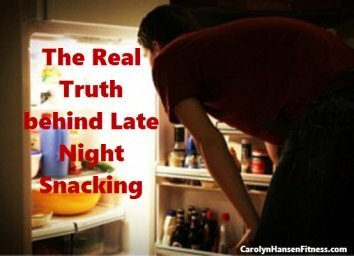 Originally we were conditioned to eat after sunset in order to have enough energy to get through the night and why many scientists and researchers believe that’s why many people’s hunger still peaks around 8 at night. However most diets of today cause even more issues because daytime dieting causes people to give in and binge at night. They work hard all day…skip breakfast and avoid high calorie snacks only to sabotage themselves at night with hunger pangs and a weak will from poor food consumption. Truth is, when you eat is as important as what you eat. Not only does nighttime eating put your overall health at risk it causes your weight to creep up. A good part of it is really just a matter of numbers. Most times, activity levels drop after dark thus burning off less surplus calories. Night eating also affects your body’s production of two key chemicals: leptin and melatonin. Melatoninis a sleep hormone…it is what make you drowsy. When you have low levels, you remain more alert and less drowsy. Leptin, is the satiety hormone and reduced levels of this hormone result in your brain not getting the messages that you’re full. This causes you to eat more. They go hand in hand. The more you eat, the less you sleep and the less time you are sleeping, the more risk there is of reaching for another snack…and another and another. This eventually leads to sleep deprivation, anxiety and depression eventually resulting in a complete cognitive decline. Our bodies are smart machines and when the sun sets, the body begins to power down…almost as though the battery is running out. This makes cells more resistant to insulin’s effectsand if you’ve just powered down a hefty after-meals snack you most likely are now dealing with high blood sugar which always presents a long-term diabetes risk factor). Research has shown that eating more food in the a.m. decreases your overall intake for the whole day while eating at night produces the exact opposite effect. That said, it’s obvious the answer is not only cutting out those late night excursions to the kitchen but to amp up your food intake during the day to more balanced meals that reprogram your body to crave less food at night. One scary study revealed that 1/3 of people downed 15 percent of the total calorie intake for the day after 11 at night. But it doesn’t have to be this way and if you find yourself in that category its time to take action. Don’t get defeated before you start. This likely won’t happen overnight…your late-night eating habit may take a little while to completely dissolve. The trick is to do a little better every day by consuming less calories at or after dinner. “Stop Weight Loss Resistance” recognizes late-night eating as a contributor to weight-loss resistance along with many other symptoms. It’s time to step to the plate and take control…you can take that excess weight off…you just need the right help.